When you need to make an impact, professionally bound materials are a great way to go. Saddle stitching is the perfect solution for smaller sized booklets and catalogs. Simple and cost effective, saddle stitching is an ideal method for binding booklets, magazines, notebooks, catalogs, programs, workbooks, calendars, menus and large brochures. Saddle Stitching is the process taking signatures, or sheaves of folded paper, and fastening them together on the centerfold with several staples. This method is termed saddle stitching because the paper "saddles" a metal frame to align the spine of the paper under the stapler when being stapled together. When designing your saddle stitched piece, take into consideration creep. Creep is created because the pages must be placed inside one another, causing a gradual edge protrusion on the inner pages as more pages are added. The more pages you have, the more creep allowance you will need. Once assembled, the pages will be trimmed to create a flush edge for a professional commercially printed product. Saddle stitching is generally used for printed materials that are 4 to 64 pages. We also offer variable data options for your booklets with our digital printing capabilities. What this means for you is that we can place individual names, addresses, or other unique data on each individual booklet. 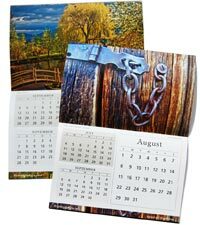 You may want to explore more options on our digital printing page. Along with the custom binding, special sizing, papers and finishes are also available. All of our products also include free gloss aqueous coating. We can also incorporate foil stamping, embossing, or die cutting into your design to help you achieve an original look and feel. Saddle stitching is cost effective and attractive. As with many printed products, the unit price goes down as the quantity goes up. Our base pricing for offset printing starts with a minimum of 250 pieces, however, we are happy to accommodate much shorter runs on our digital press. Contact us at 800-­930-2423 for details and pricing on small run saddle stitch marketing materials. Our experienced print professionals can help you with your custom binding project. Just give us a call at 800-­930-2423.